Flashing turn signal means Go Faster!!!! What is the correct way of changing lanes when driving? You turn on your turn signal right? I’m sure every driver in the metro right now has experienced what I’m about to say on this post. Transferring from one lane to another seems to be an irritating moment for most drivers. I don’t really understand why drivers behind you or beside you tend to go faster whenever they see the vehicle’s turn signals on and about to change lane. It’s just but natural for the freakin’ drivers to step on the gas to fill the lane and not to make the vehicle changing lanes pass. What is the rush they get out of it? I guess its innate to most Filipino drivers that when we see a vehicle about to change lane, we just have to go faster to block the vehicle’s path. Give the turning vehicle a break! At least, it’s changing lanes properly by flashing the turn signal and not just cut off the vehicles beside t.
Next time a you see a vehicle flashes its turn signal on, ease up on the gas pedal and let the vehicle pass. Let’s not add on to the stress we have from work and all other problems we face. Imagine, if thousands of drivers would be courteous even on changing lanes alone, we can absolutely be successful in reducing stress. 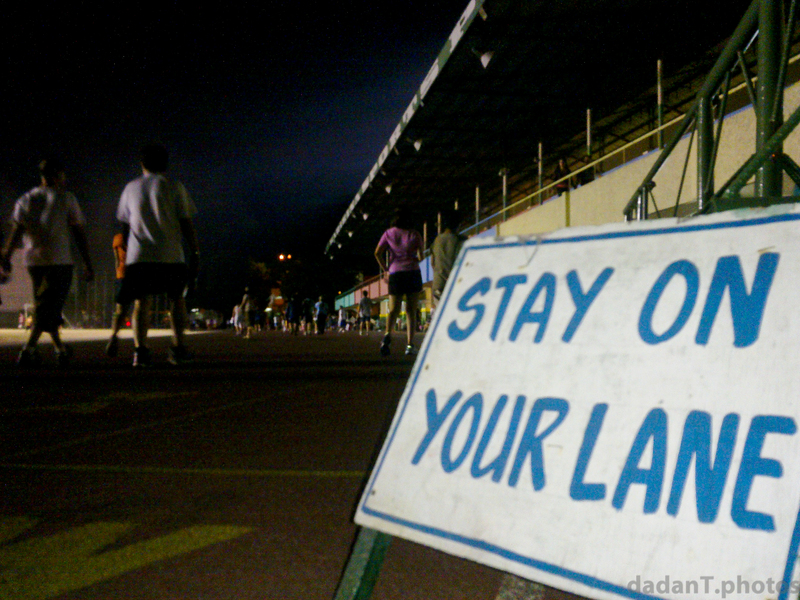 On a final note, I would like to share to you a picture taken from a track oval…..
STAY ON YOUR LANE on a track oval? You gotta be kidding me! haha!